"You never know if the next person you meet will change your life." Jeff Pulver, a Tech Entrepreneur and Investor once said this to me in a meeting. It's one of those pivotal sentences that have stuck with me, echoing in my head right before I was set to meet an important person - (actually the thought ran through my head before walking into a meeting where I met my husband, but that's another story.) More often though, it's been a mantra for me before Networking events, speeches and workshops and hey, even standing on line to buy coffee or seated on an airplane. Because any of these places are fertile breeding grounds for chance encounters that can truly change the course of your life - personal or business. I truly believe that we can help luck along by being prepared for opportunity when it knocks. And one of the must-have tools in our storytelling arsenal is the infamous Elevator Pitch - or the "Quickpitch" as I have often dubbed it. The term Elevator Pitch has come to mean how you would tell your story if you met someone super important and had a very limited amount of time to hook so they wanted to continue the conversation (i.e. in an elevator). In an age of pervasive ADD and Smartphones, if we haven't grabbed someone's attention in 30 seconds (some might argue 10) then we've blown the opportunity. Just stating what you do or what your company does in complex or boring terms can bring the conversation to a screeching - and quite awkward - halt. 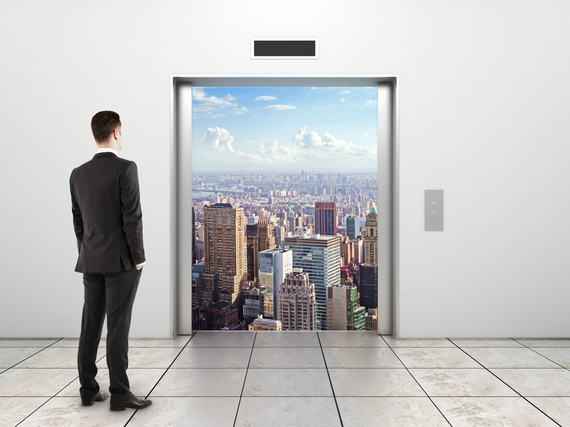 The (Actual) Elevator Pitch - I had the utter pleasure to coach pitches for the Elevator World Tour where 100 startups get the opportunity to pitch investors in an elevator competing for a sizable cash price. This has taken place in Paris, Toronto, Tel Aviv and more - and always in a very tall building where the time from ground floor to top and down again was an average of 1 minute 26 seconds. So for me that's a good rule of thumb - have about a minute prepares with room for about 30 seconds of Q & A. And what's in it? The Problem you are solving + Your Solution + Some staggering fact about the market or something amazing you've accomplished. That's it! The hope is that you will have grabbed their interest and now they are intrigued, asking questions and continuing the conversation. The "Handshake" Pitch - This is what usually happens at a Networking event, people milling around, chitchatting and the phrase "so what do you do?" is the star of the evening. Here you have about 20 seconds to grab them. And the content? Here's the beautiful part - THE SAME! Problem + Solution + Intriguing fact - but condensed. And no - it's not your Elevator Pitch at warp speed, it's a shorter, yet powerful version. The "Eyeblink" Pitch - Imagine that you were at a conference and you see Mark Zuckerberg walking past you and you have the perfect company for a Facebook acquisition. Zuck's not going to stand around waiting as you hem and haw - you have to give him the bottom line up front - the hook. What does he stand to gain by associating with you? I would create about 6-7 different "Eyeblinks" and have them ready to go at a moment's notice to the right person. The Whatsapp Elevator pitch - Texting has become our number one way of communicating. Phone call? That's so 2005... But try putting a picture on a text, or group texting? And what if you have a limited data plan on your cell plan like most teenagers do? Whatsapp is a messaging app that lets you communicate with one or many people with text and rich media - links, pics and emoticons. Only people you include in the message can see it, and everyone in the group can talk to each other. We have 450M active users (the figures at time of purchase), growing by 1M a day, and are almost as high as the volume of all text messages sent in the world! The Whatsapp Handshake pitch - Texting is great but try texting pictures? Or texting a group? Whatsapp is a messaging app that lets you communicate with one or multiple people sharing pics, videos or links in a snap, for free! And with 1M new users a day - we have almost as many messages as all SMS's sent globally! The WhatsApp Eyeblink pitch - Zuk, your numbers are down, we're growing by a mil users a day - and the kids love us! Of course if I were pitching to an investor or a potential user, I would change it slightly to make the pain more personal to them, but the overriding structure would stay the same. Since you can never know who you are about to meet, you should be prepared for different scenarios. Lirone Glikman, Business Networking Expert says that you should find interest in the other person first and listen to their elevator pitch to better understand who they are and if you can benefit each other in some way. This will allow you to adjust your pitch accordingly. Lirone also recommends that instead of saying exactly what you do in your pitch, have fun with it! Use your imagination and craft a creative description of your job that will make the person you are talking with take notice, ask for more information and become more interested in you. For example a Cyber Security consultant becomes a "Light Warrior", a Lead Generator becomes "an Influencer that helps people get what they need" and as a Corporate Storyteller I've often introduced myself as the Pitch Whisperer, or "I help people become compelling storytellers - turning boring data into messages that drive to success" or more simply - "I help people not be boring." So create your Elevator Pitches, then create a few versions of each, get out there and practice, practice and practice on anyone and everyone. The more comfortable you feel giving them the better they will get then the more you can get creative and change it up to match different people on the fly, when it matters most.